Dark days can be life threatening. We have to develop an adequate level of spiritual, psychological and physiological adjustments. We can live with confidence in God's sufficiency. 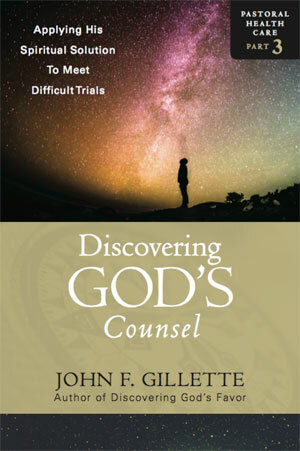 John F. Gillette’s story begins and ends with a song he sang in his childhood, “His Very Own, Wonderful Grace in His Word is made known, chosen by the Father, purchased by the Son, sealed by the Spirit, I am his very own.” His desire every day is to glorify the Lord Jesus Christ in health and in sickness. He has learned every moment needs to be in God’s presence. Divine dialogue is a developmental process. He has been a lifelong student of the Scriptures. It is easy to fail the standards of God but he has an inner passion that he calls “the holy urge” to encourage him to go forward. His studies have been in the liberal arts but always guided through his biblical deep rooted foundation. His graduate research has been in religion and leadership. He has served Jesus Christ since his childhood with diversity, independence and confidence in education, pastorate and leadership. His pastoral health care discovery series was published to help himself and minister to others that are having struggles in making spiritual, psychological and physiological adjustments.